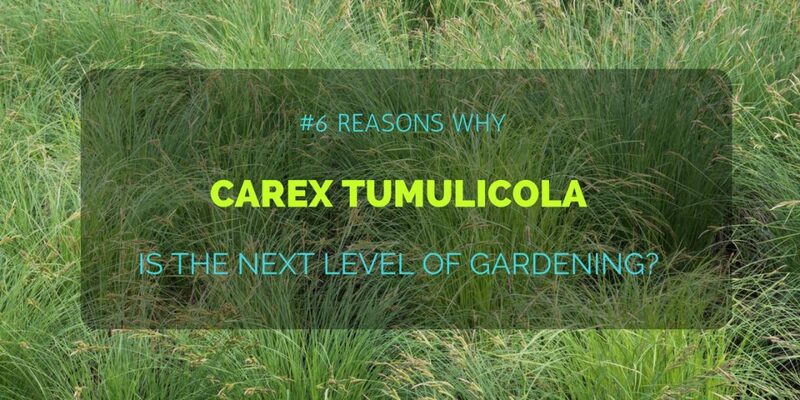 6 Reasons Why Carex Tumulicola Is The Next Level Of Gardening? / 6 Reasons Why Carex Tumulicola Is The Next Level Of Gardening? Also known as Foothill Sedge, Carex Tumulicola is an often neglected option to high end gardening. When it comes to taking a garden from the status of good to amazing, this humble little plant is a ‘fine gardening’ essential! It’s a plant that’s never let me down because of its uncanny ability to grow just about anywhere. There is, however, much more to it. I would be remiss to mention Carex Tumulicola as nothing more than an excellent space filler (which it is). Therefore, I’m giving you my very own list of six reasons why this awesome little plant has changed the way I landscape. So if you’re looking to change your perception as a gardener through very little effort and complication, then read on. Foothill Sedge is one of the few plants out there that isn’t fussy about sun exposure. You can safely plant it under a tree, out in an open field, or directly in the shade of a building or wall. Remarkably, Carex Tumulicola looks exactly the same no matter where you plant it, making it one of the best evergreen varieties out there. It’s also very adaptable in relation to the soil you plant it in. Foothill Sedge is not very fussy about acidity, moisture, soil consistency or nutrient density. Its adaptability also extends to weather conditions. All year round this accommodating plant will thrive throughout autumn, winter, and spring. That being said, however, Carex Tumulicola is a summer plant, and prefers heat to frost. One of the most helpful aspects of Carex Tumulicola is its ability to blend in just about anywhere. It’s safe to plant this little shrub in between other plants & trees because it won’t affect the growth of those plants or invade their space. Another reason this plant is a gardener’s dream is because it can be planted alongside or in between other garden items. These include park/garden benches, sidewalks (some occasional trimming may be required), garden staircases, stepping stones, ponds & fountains, and birdbaths. The versatility of Carex Tumulicola allows you to plant it as a garden external (outside of flower beds), or as part of your main garden display. Since it doesn’t have demanding sun & shade requirements, placing it under trees is a keen favorite of mine. Many shrubs that are easy to grow are expensive or difficult to get hold of, but this is not the case with Foothill Sedge. During spring time, this shrub can be separated and multiplied by planting sections elsewhere. It’s actually possible to use one plant to eventually propagate your entire garden! Besides its easily dividable properties, Carex Tumulicola also spreads itself at a comfortable pace without suffocating surrounding plants. Despite its lush appearance, it doesn’t need rich or well-tended soil to thrive in most environments. Watering Carex Tumulicola isn’t something you will have to do too often either. Its propagation properties are simple despite soil conditions, surroundings, or weather. This makes it one of the best plants for public areas where frequent maintenance is not always present. Public gardens are especially under inadvertent threat of being damaged by playful children, animals, and people who are aren’t cautious about where they walk. Carex Tumulicola is the answer to these types of places because it’s super resilient. Foothill Sedge has an amazing way of withstanding being stepped on, laid on or trampled by groups of people. Not only will it stands tough in these circumstances, but even if it does get damaged it will recover rapidly. When these plants are spread throughout a garden or park area, you can be sure they will not suffer damage easily. It’s another one of those plants that gardeners and landscapers won’t have to worry about after they’re established. Grass varieties can be fussy. While there are some great grass species out there that don’t need too much sunlight, they can still require a lot of maintenance and watering. This again is one area where Foothill Sedge can outshine its grassy cousin. Carex Tumulicola has a similar consistency to grass, and we already know that it retains its color throughout the year—despite some unfavorable conditions. It also has a soft—but tough—texture which is comfortable for a barefoot stroll around the garden. Taking into consideration its low maintenance requirements and excellent ability to grow in the shade or the sun, Carex Tumulicola is a viable replacement for grass if said grass is not easy to grow and/or maintain. Now I want to talk to you about the look of Foothill Sedge. This plant is a keen favorite of mine for its aesthetical qualities. Further to its color retention and lush texture, this shrub gives off a completely distinct look and feel to any garden area. To put it plainly, Foothill Sedge is a delightfully wild shrub. Spreading it far and frequent is a sure way to completely alter the dynamic of your garden or park area. While winter and autumn take their toll on other gardens, keep yours lush and beautiful with this versatile plant—and years down the line you won’t be sorry that you took my advice. Strangely enough, its wildness doesn’t for one second take away from its potential to fit in anywhere elegant. Wedding venues will benefit from this shrub and so will outdoor restaurants, parks, and playgrounds. For gardeners and landscapers who want to move up to the next level of gardening, this is one plant I highly recommend. Gardens should possess that wild valley factor and generate tons of ‘wows’ from those who visit them. Carex Tumulicola is a plant that achieves this high end gardening feel, so don’t discount it in your next garden outlay.